e2f – e2f is a professional translation agency. They work inside Transifex, leveraging available tools such as Translation Memory and Comments. Gengo – Gengo is a translation network powered by pre-screened native speakers. Their translators work outside of Transifex. TextMaster – TextMaster is a translation network powered by pre-screened native speakers. Their translators work outside of Transifex. Only Organization Admins can place translation orders. From the project navigation in the Dashboard, select the project you want to order translations for. Click the Order button in the header. You can also initiate an order from any Order button found throughout other parts of Transifex. In the popup, select a translation vendor. Set details such as translation quality, tone, and content type, then add any instructions which you would like the translators to see. Select which resources you would like to include in your order. Only untranslated strings are sent for translation. You can also add resources from other projects to your order. Choose the languages you want translations for. Here, you'll see for the selected resources how many untranslated words there are in each language. Note that your project's language codes (source & target languages) must match the ones that each vendor supports. Review your order. If everything looks good, click Order. You'll receive an email confirmation after placing your order. Turnaround times will vary from vendor to vendor. Once you've placed an order, you'll be able to track its progress inside the Orders page, which is accessible from the main navigation. 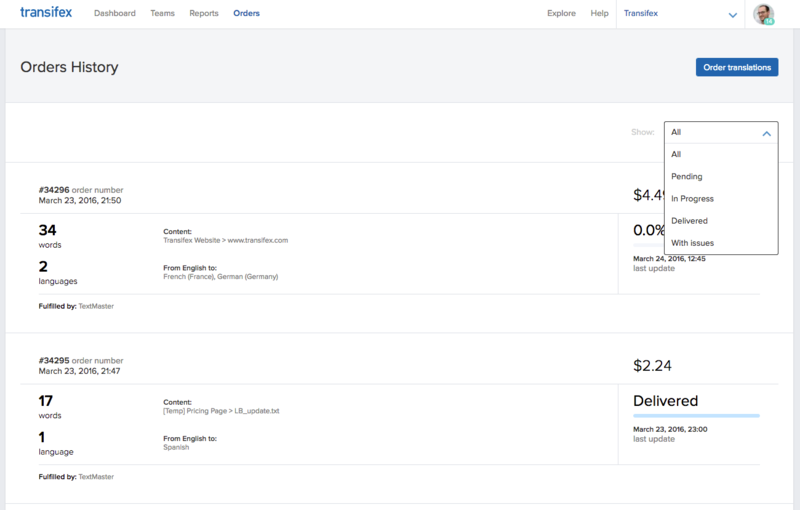 On this page, you also be able to see order details such as price, words, and languages. You can also filter orders by their status. Translators may sometimes have questions about the meaning of a phrase in your order. If so, you'll receive an email notification with their comment or question. Follow the link inside the email to send a reply to the translator. e2f works inside Transifex. When you order translations from them, their translators are added to the team(s) associated with the projects you ordered translations for. These translators will only see the content that is part of your order. And when the translations are complete, they are automatically removed from your organization. There is a minimum order size of $20 per language when ordering from e2f. Additionally, while e2f's translators can see and use Translation Memory suggestions as they work, TM leverage is not factored into the pricing. The price per word is the same regardless of whether it's a 0% match or a 95% match. 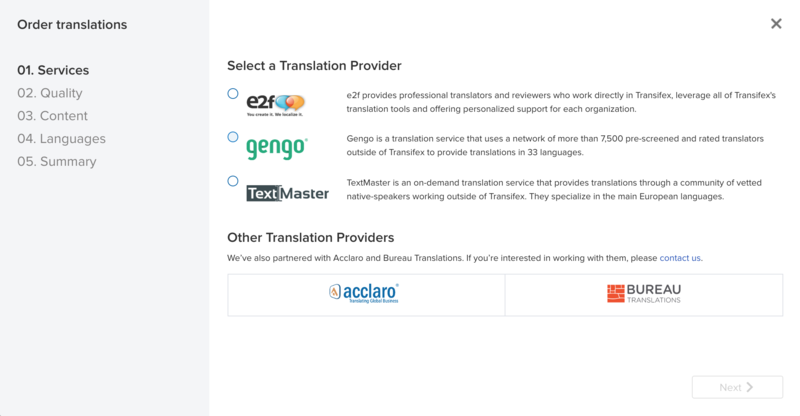 If you would like to cancel a translation order placed with Gengo or TextMaster, please contact us. We'll work with them to cancel the order before any work begins. For e2f orders, please email translations@transifex.com directly. Are instructions and developer notes sent from Transifex to Gengo and TextMaster? Yes, both instructions and developer notes are sent to Gengo and TextMaster. However, you must provide this information before submitting an order. If there are issues with the translations from Gengo or TextMaster, what's the process to get them edited? Before saving a translation from Gengo or TextMaster to Transifex, we run the translation checks that you have configured. If there's an error, we automatically send this error to Gengo or TextMaster as comment to the specific job. Their translators will then have the chance to fix them and resubmit the translation. If an order is already marked as delivered in Gengo or TextMaster, then you'll need to contact us, and then we'll contact the corresponding vendor and ask them to make revisions. The revised translations will be delivered via email and you'll have to manually update the revised translations. If I make an order (Order 1) and then I make another order (Order 2) before the first one is complete, will Transifex recognize that some strings are in the process of being translated (in Order 1) and not include them in Order 2? Correct, Transifex will skip over the strings that are already included in Order 1 and will not include them in Order 2, so you won’t be overcharged for the same strings. Can I order translations through API? No, but you can order translations within the Transifex UI. Translation order pricing depends on the number of words for translation and translation vendor that you choose to place an order with. You’ll see the pricing after completing steps 1- 6. At this final step, you can review the order details and decide to proceed or not. Can I make an order to translate from a non-English language? Although it isn't displayed in the order wizard, many providers do work with a source language, other than English. When you need a translation from Chinese, German, Korean etc. into other target languages, please contact the translation provider directly. I've placed an order and updated my strings. Why am I still charged for so many words? Please note that your credit card is charged at the moment of placing an order, i.e. for the amount of untranslated words that were sent off for translation. If you update the source strings, it will not trigger recalculation, as the order has already been placed. Our recommendation would be to not edit the source strings after placing an order, please make sure that you have the strings finalized and ready for translation before placing an order. Can I choose which strings to order for translation? No. The system identifies and takes all untranslated strings available in your resource file. As of now, it's not possible to choose specific strings among all untranslated strings.